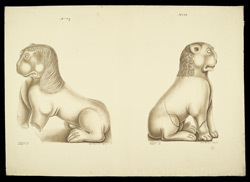 Wash drawing by Murugesa Moodaliar of two guardian lions from the Great Stupa of Amaravati. This is one of 42 sheets (89 drawings) depicting sculpture from Amaravati and S. India. Inscribed with numbers 2 to 90 (1 is missing) and with measurements; signed:' P. Mooroogasa Moodr', dated c.1853. was completely covered with narrative reliefs and elaborate decoration. At each of the cardinal points there was a gateway. Between the railing and the drum there was a circumambulatory passageway. The enormous cylindrical drum was elaborately decorated with sculpture. The outer surface had a series of alternating slabs and pilasters. The slabs are carved in great detail with representations of the stupa and represent an invaluable source of information about the original aspect of the Great Stupa. In 1845 Sir Walter Elliot uncovered sculptures at Amaravati and sent them to Madras where they were left exposed on the green in front of the College. In 1853 the Court of Directors made enquiries about their condition and they were moved into the front entry of the newly founded Central Museum, Madras. Edward Balfour, the officer in charge of the Museum, commissioned the Rev. W. Taylor to report on them. It seems probable, in view of the water-marks, that these drawings were made for the Company at this time by an Indian draftsman, Murugesa Moodaliar. In 1859, one hundred and twenty-one Amaravati sculptures were sent to London, including the ones depicted here. The drawing depicts two figures of seated guardian lions that were mounted originally on the railing of the stupa; there were two pairs of lions at the four gateways opening onto the circumambulatory passageway. The lions were seating facing each other on either side of the opening. These sculptures have been assigned to the first phase of the High Period of sculptural activity at Amaravati, 2nd century AD, when the best part of the rail pillars were produced.